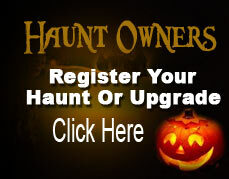 Featuring 4 Haunted Houses in One Location: 13th Street Morgue, Dungeon Of Doom, Reindeer Manor and The Shadow House. Once inside the park you gain access to any fear of your choosing. Choose the 13th Street Morgue and face your fears of what really happens when your heart stops beating. See what's behind door number 2 with the all new 3D Dungeon of Doom. If you still have your wits about you, venture over to the new fears that have been unearthed inside Reindeer Manor, the oldest haunted attraction in Texas! For those brave enough to enter all 4 via the All Show Combo Pass, you are granted a look inside The Shadow House - using just a single glowstick to light your way. As this is an all night experience, there is food on hand for when your stomach growls, as well as other entertainment and souvenirs of all types. *free live performances like the Thriller Dancers, the new Ariel Performances, the Extraordinary Equine show, and FIRE FIRE FIRE!! *all new escape room game! *all new Axe Throwing Booth!